“Angel” No. 0’s release will coincide with the character’s comic-book debut in “Buffy the Vampire Slayer” No. 4. In the upcoming comics, Angel will stumble upon a new demon uprising and learn that his humanity could be restored by taking the life of a certain Slayer who resides in Sunnydale. Angel seems to be in a suburb with a church on one side and a row of houses on the other. It does not invoke LA for me, even though I've never been. I tend to associate Angel with more urban environments. Aw, wee baby Angel! Looking so Young! getting a bit of a Damon Salvatore vibe though. Is this a bit of a role reversal? Spike being in town, possibly having a connection with Cordy, being semi-decent compared to Angel rolling into town to kill himself a Slayer. Angel rolling into town to kill himself a Slayer. "Without giving away the way we are going to approach [their relationship], it’s kind of bitter sweet – the tragedy of it, love and its boundaries," Hill said. I am not sure if I am happy, though, because it will be weird is Buffy will just be one of many ... and not even the "first." Angel looks like a baby! So will there be crossover issues or will they be separate? 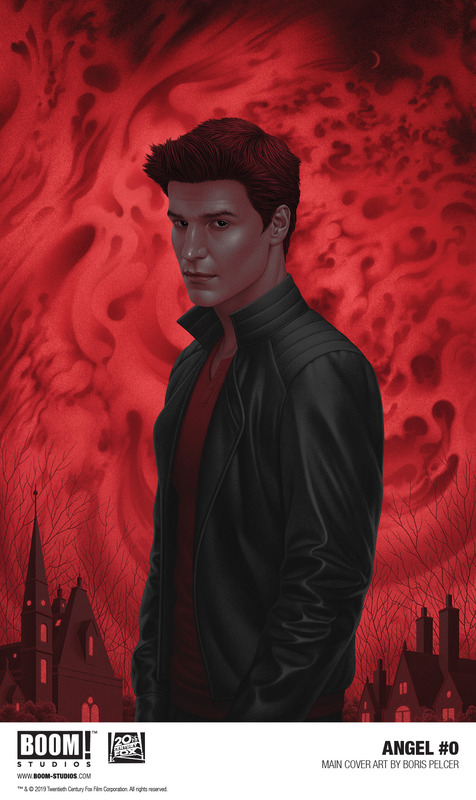 Angel will make his debut on Buffy, but the first issue of his own comic is coming out at the same time. From then on, it seems they will make appearances in each other's comics. I don't know how to feel about this... « somewhere in the mix » doesn't really sound like a good thing. I hope they manage to make the bound between Buffy and Angel seem significant somehow, though I don't see how they'll be able to establish a connection within one issue. What I'd love is for them to do like the Avengers crossovers. Each have their own separate series and a crossover Buffyverse one where eventually other characters would join, maybe like Faith? I'd love to see the comics world get expanded but I also want my favorite characters to have meaningful interactions. It would have been great if the original shows did this. However, in the BOOM comics, there may not be the same shared history. It feels likely that Faith may show up on Angel rather than BtVS. Who else is going to be in the Angel comic? Gunn and Doyle, I guess. But if she shows up there first, she is not going to be the same Faith who had a meaningful and complicated relationship to Buffy. Nice to see Angel and the art is great. But I am still stuck on the writer's earlier interview about disliking Angel and the "team Sweetie Pie Spike" comments. lol So.....boy, I am hoping well for Angel. But I am wary for him. About at first disliking Angel. Not disliking Angel. There is a big difference. There are many posters here on this forum that "at first" disliked Riley then completely change their tune in subsequent years. To me this is no different than that. Nice to see Angel and the art is great. But I am still stuck on the writer's earlier interview about disliking Angel and the "team Sweetie Pie Spike" comments. lol So.....boy, I am hoping well for Angel. Disliked. Past tense. As a teenager. And Jordie won't be writing Angel. Angel #0 will officially kick the series off next week on April 17, and will do so exclusively as a physical comic. Digital copies of Angel #0 will begin to be sold two weeks after that, so for now, the only way to read the issue will be to pick up a copy in-store. They are doing Spuffy with Angel and Bangel with Spike and I suspect they might, to a degree, be doing Baith with Woods. Yes. All of this is cooked up as a personal insult to you.